This is no ordinary college. If one of the year’s honorary doctorate recipients happens to be British rocker Jimmy Page, guitarist from Led Zeppelin; if your alumni includes such luminaries as Melissa Etheridge, Quincy Jones, Diana Krall, Branford Marsalis and John Mayer, and should your undergraduate class draw from 67 countries across six continents and 43 U.S. states, you know you’re at a very special school. This is Berklee College of Music, the largest independent college of contemporary music in the world — renowned for its rich list of jazz, classical and rock musicians, and an alumni honor roll that includes an impressive 99 artists who have between them received 229 Grammy Awards. “It really is an extraordinary college,” admits Berklee College of Music Bookstore Manager, Frank Moore, “The students, staff and faculty are all very passionate about what they do, and every one is so excited to be here. There’s an energy on campus that’s really infectious,” he adds. And he should know, because the Berklee College of Music Bookstore in Boston, Massachusetts is no ordinary place either. 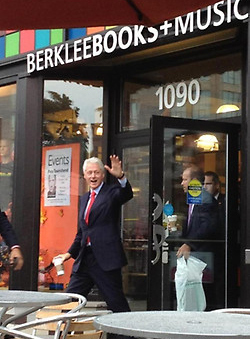 Former President Bill Clinton waves to the crowd of onlookers as he leaves the Berklee College of Music Bookstore after purchasing several books. If you believe Henry Wadsworth Longfellow’s view that, ‘Music is the universal language of mankind,’ one of the places you might find help studying that prose is at the two-level store at 1090 Boylston Street. It would be difficult to miss with the eight-foot-tall saxophone hanging above its main entrance. Catering to a customer base far beyond the Berklee campus, the store is an emporium of all things music. 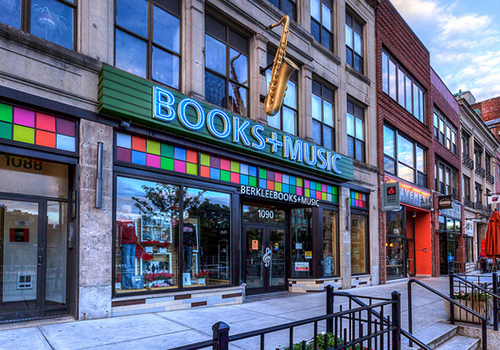 Helped by knowledgeable staff, many of them Berklee trained, customers can find drum sticks, guitar picks and strings, instrument cables, school supplies, clothing and metronomes, sheet music and probably one of the most extensive selections of books for musicians of every proficiency. It was that highly specialized, vast library of books and expert staff that brought former President Bill Clinton to the store to shop for music books while in Boston on a speaking engagement in 2012. This being the Berklee College of Music, the store stocks some particularly interesting items such as notebooks with covers made from old vinyl records, and a wide variety of Berklee branded apparel. “Our logo merchandise is an important part of the store,” Moore explains. “We really try to develop a lot of music-themed artwork into the merchandise in fresh presentations of the Berklee brand,” he adds. One of those designs, a Berklee shirt Moore had designed in the same font as the Boston Red Sox, has become top seller on campus. 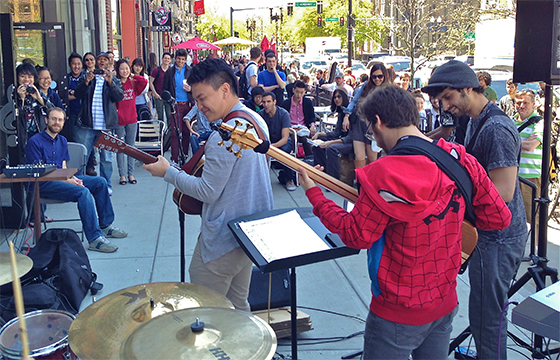 The store also provides a moveable stage for performances of poetry to acoustic events, but the real showcase is the opportunity to present Berklee’s talent right outside its doors, in a concert series held on the store’s street patio area. “It’s unbelievable the number of people who stop and watch and listen to the students perform,” Barnes & Noble College Regional Manager Glen Hoyle explains. The concerts also attract foot traffic from neighboring Fenway Park, particularly during the playoffs, when thousands of fans walk past the bookstore every game day. Students perform outside the Berklee College of Music Bookstore in Boston, Massachusetts. “It’s really refreshing to see what a destination it’s become,” Christopher Swezey, Director of Campus Business Services, Berklee College of Music, explains. “The old bookstore was horribly cramped, and it was part of our vision for the campus as a whole to ensure we did this correctly,” he adds. Swezey is referring to the investment Berklee has made in Boston and the $100 million tower at 160 Massachusetts Avenue, which includes dormitories, practice rooms, performance space and the most advanced music production complex in the nation. The city of Boston is also important to Berklee. The school gives back to the community through events such as the Berklee Bean Town Jazz Festival and sponsors competitions such as the High School Jazz Festival. The bookstore provides merchandise for these events, with a portion of those sales going back to support the concert series.